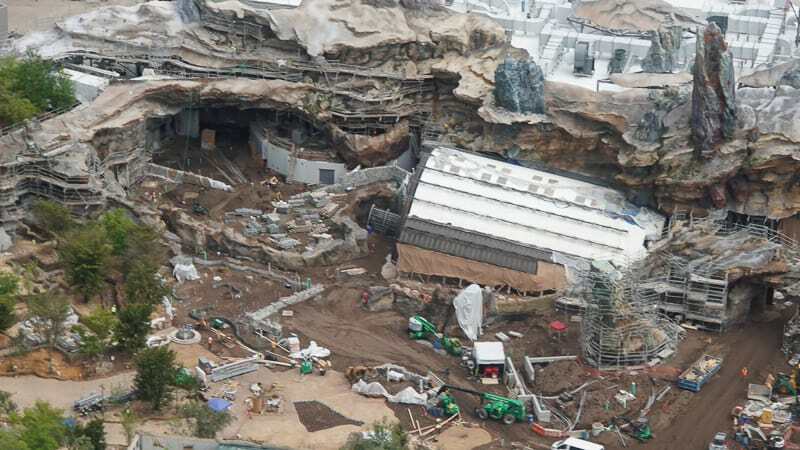 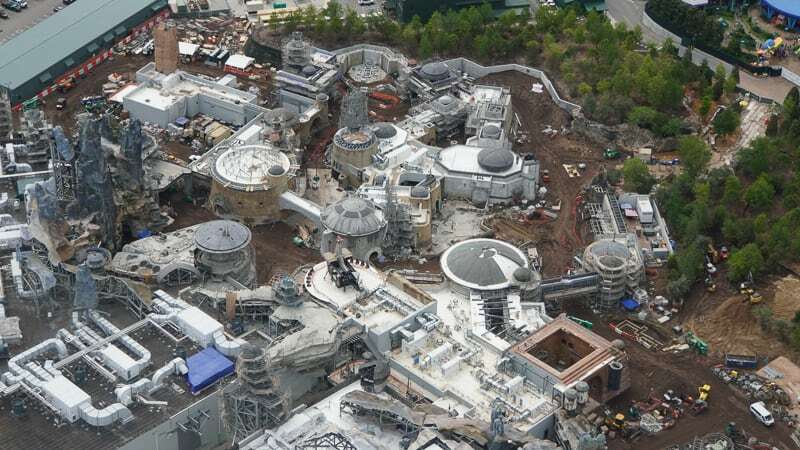 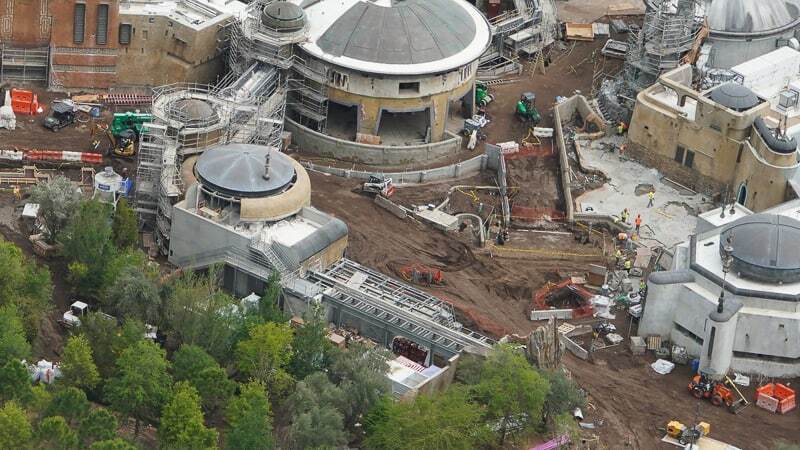 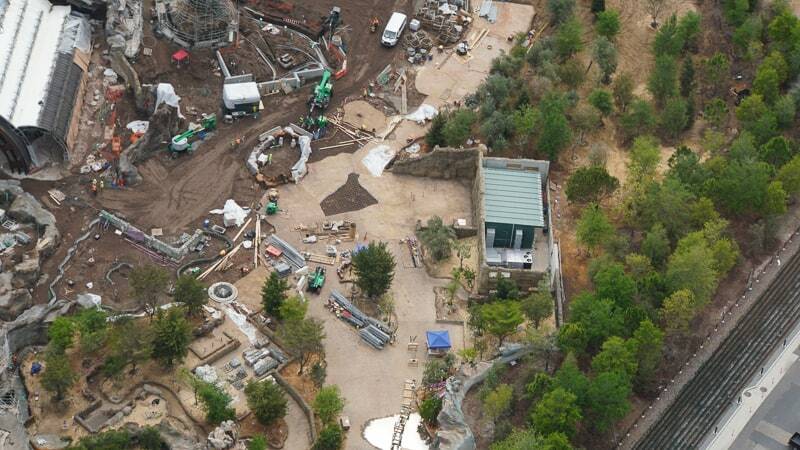 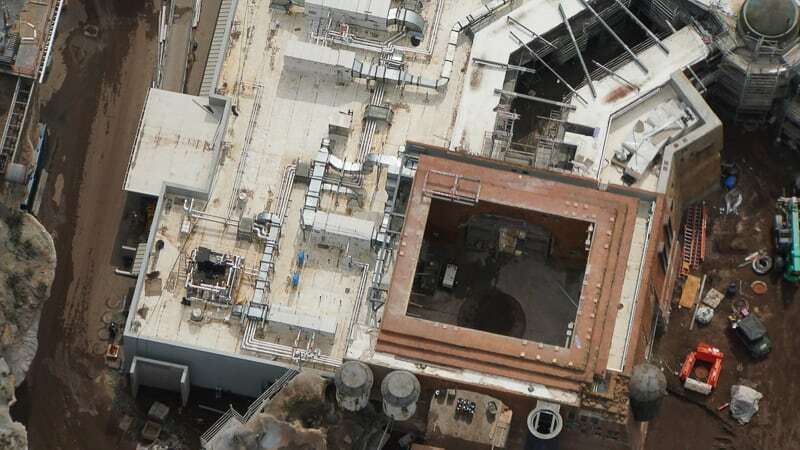 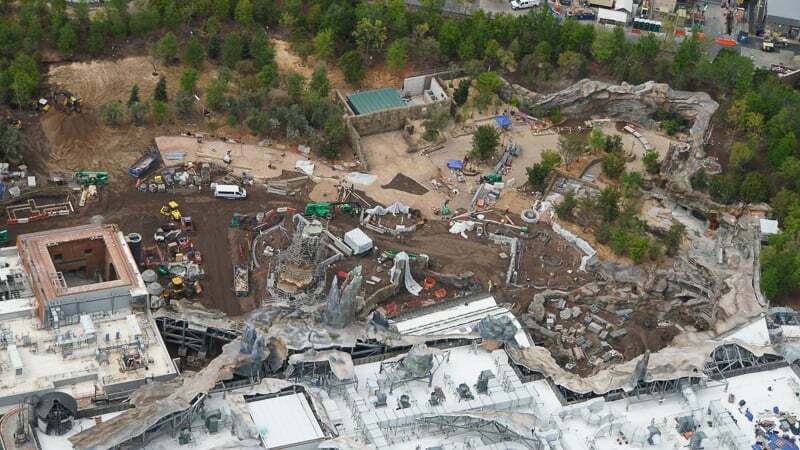 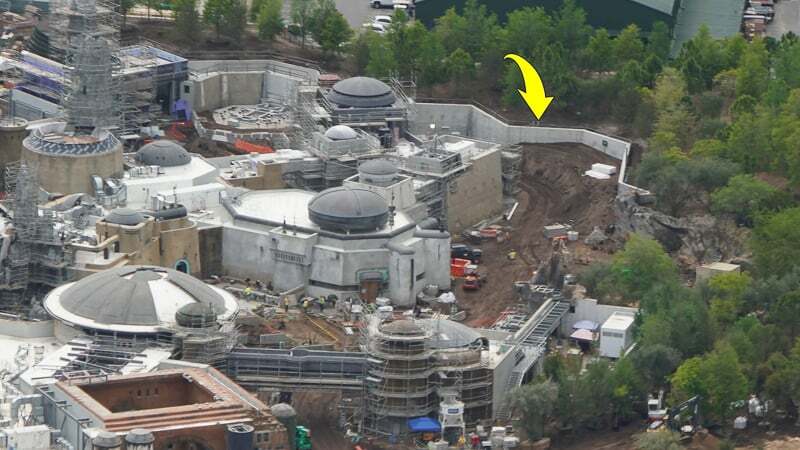 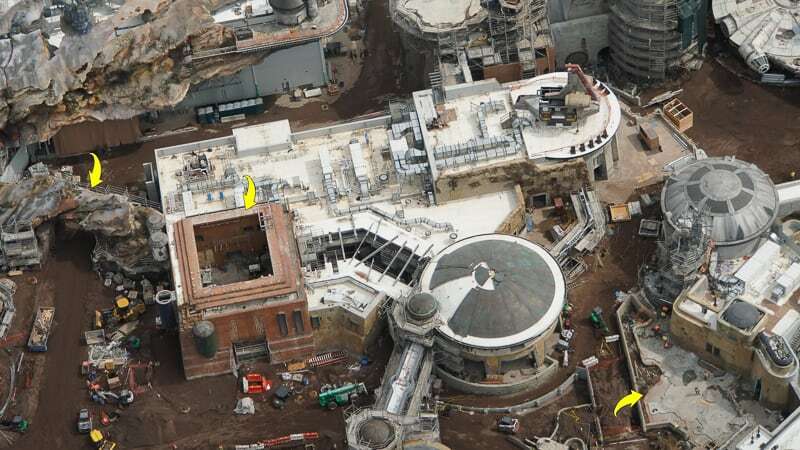 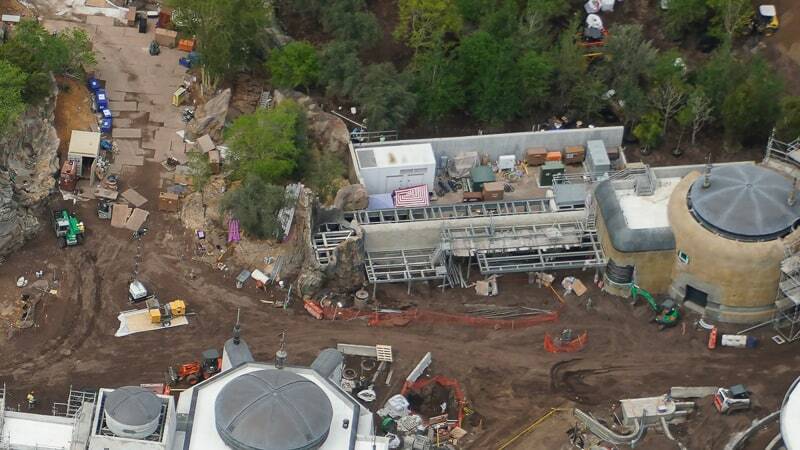 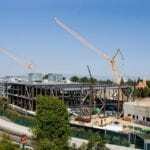 This is the latest Star Wars Galaxy’s Edge Construction Update for April 2019. 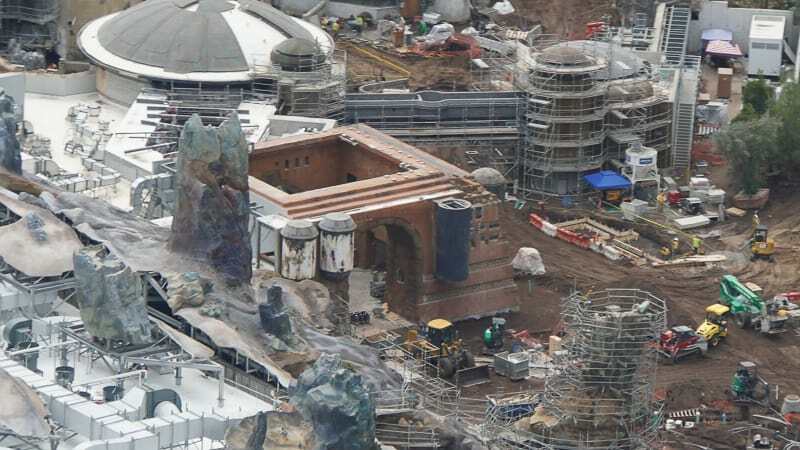 Lots of cool stuff has happened since last month’s update and there is really some incredible theming being down to Galaxy’s Edge right now. 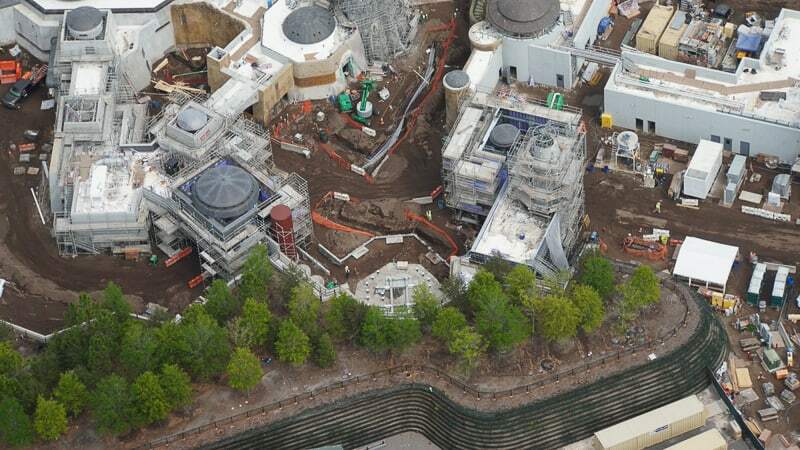 Between the walls, rockwork, and the streets getting paved, it’s starting to look like a real city! 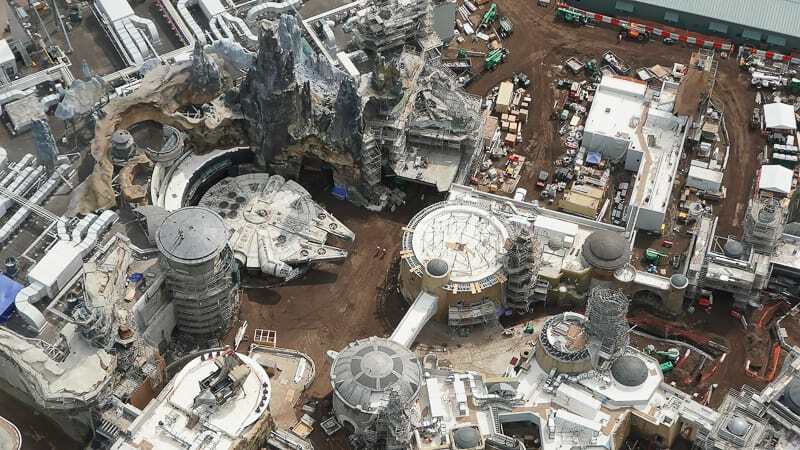 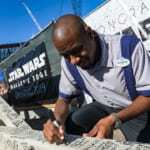 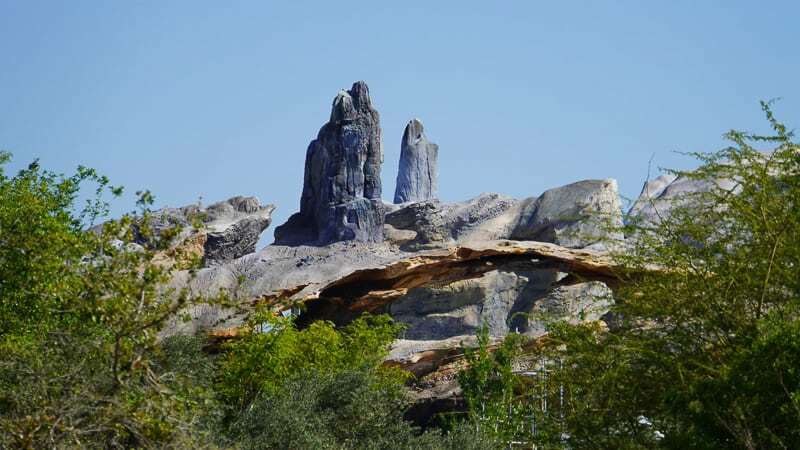 We won’t get into all the details in this post, but if somehow you haven’t heard of Star Wars Galaxy’s Edge or don’t know exactly what it is, prepare to be blown away! 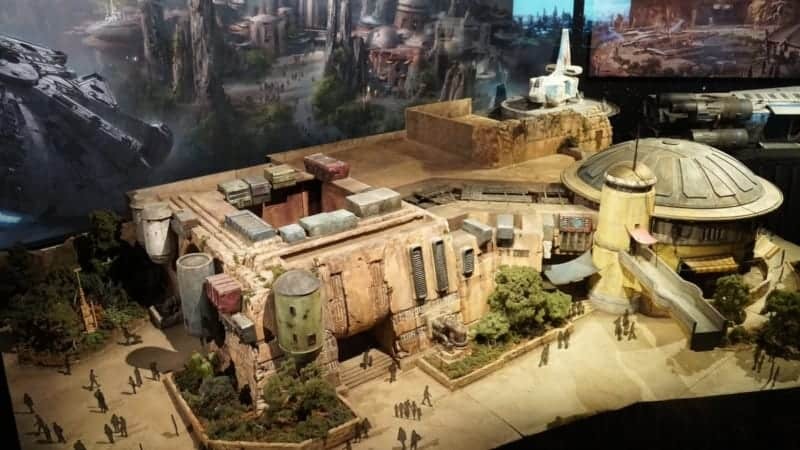 It’s a brand new, fully immersive land based on the Star Wars franchise which transports guests to the far off planet of Batuu. 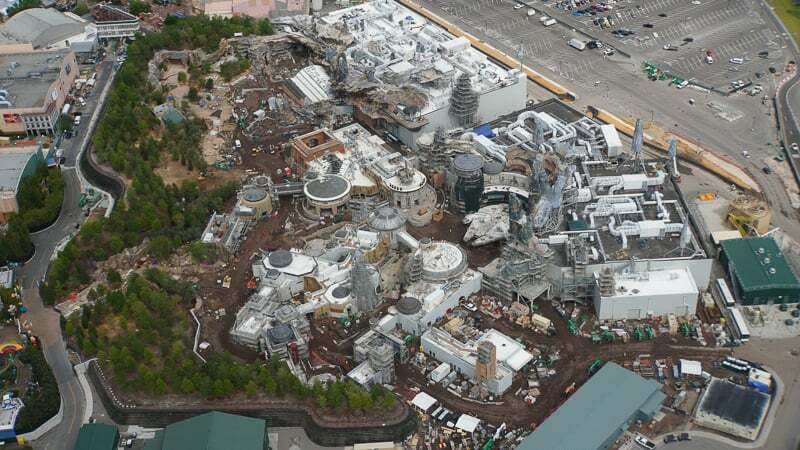 Disney is saying it’s the most ambitious theme park addition in history! 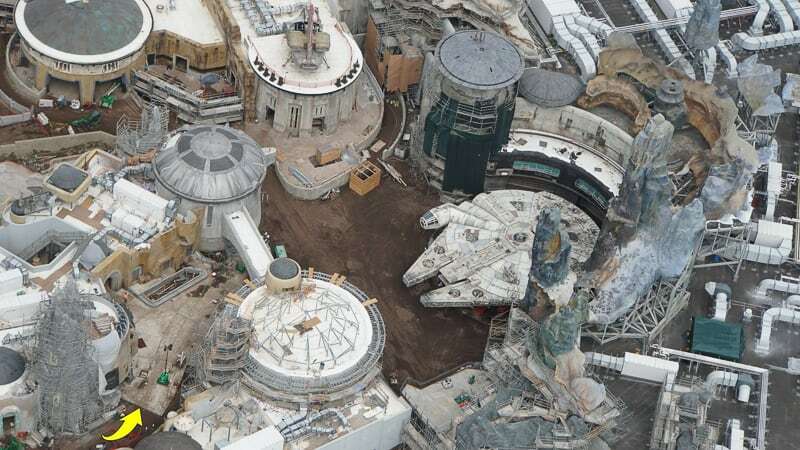 There are going to be two attractions: one sitting you pilot the iconic Millennium Falcon (Millennium Falcon: Smuggler’s Run) and the other puts you right in the middle of a battle between the First Order and the Resistance (Star Wars: Rise of the Resistance). 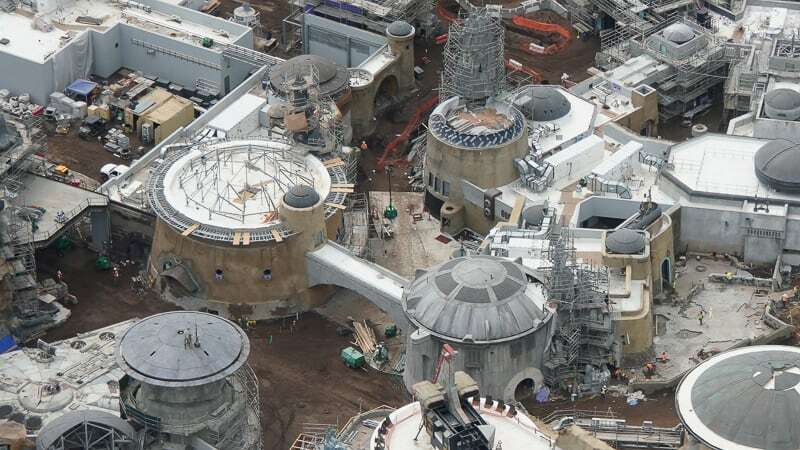 Besides the rides there will be 2 restaurants, numerous and uniquely styled shops, and tons of hidden areas to explore that Disney promises us it will feel like really going to another galaxy. 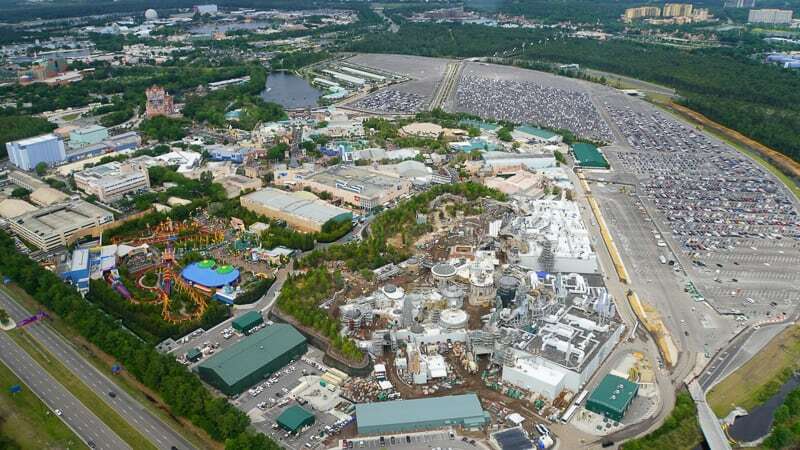 Before we get to the latest construction updates we want to thank @bioreconstruct for the great job he does with all the aerial photos high above Walt Disney World. 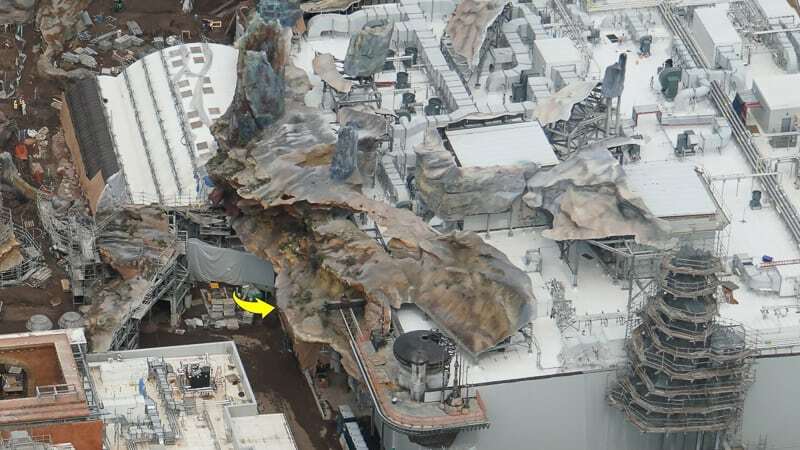 They really help us see a lot of the hidden details and everything going on! 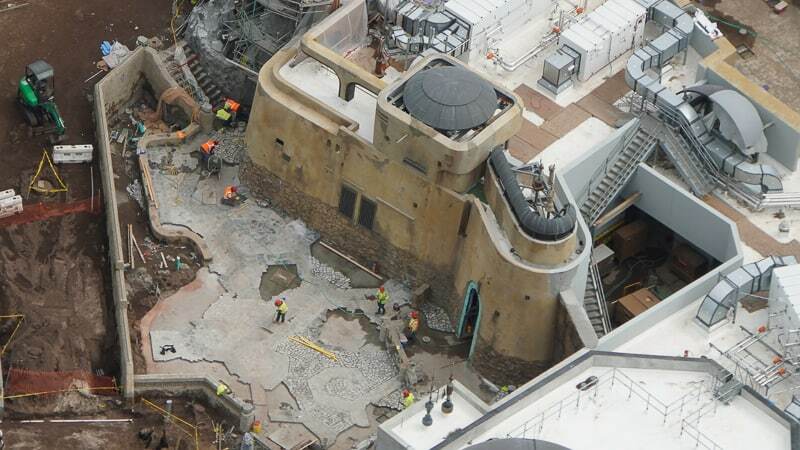 Lots of progress has been made to this building and all the buildings in Black Spire Outpost in the last weeks including a stone gate, atrium walls, and current progress of a courtyard pavement right here. 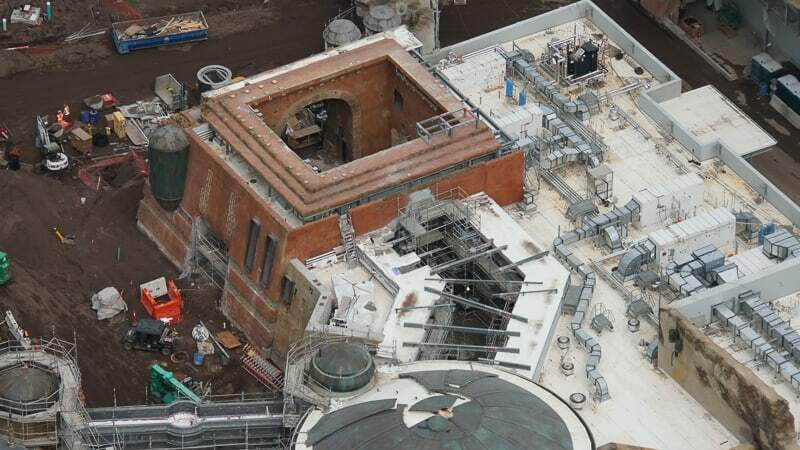 Most of the scaffolding is down around the building which gives us a much better look at it than last month. 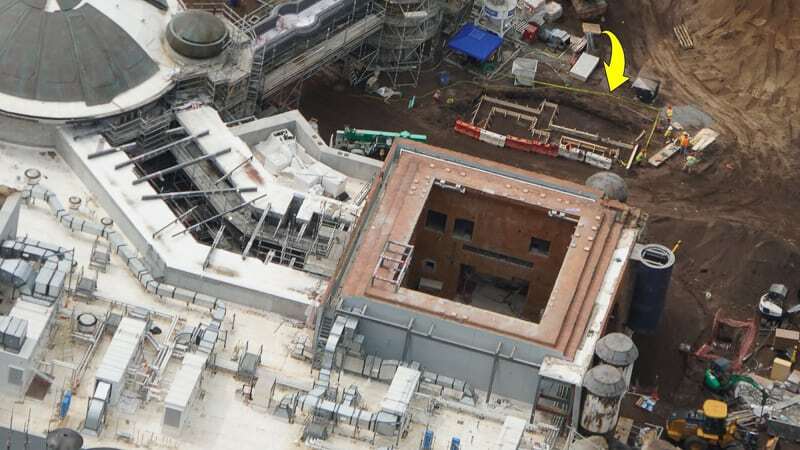 The entrance here is going to be really impressive when done, one of the best looking buildings in Galaxy’s Edge imo. 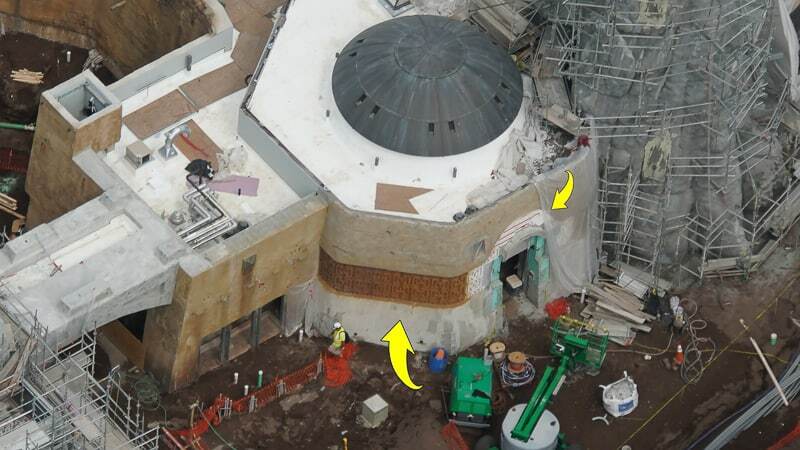 Gotta get all those details right and it looks like a really cool design is being put in! 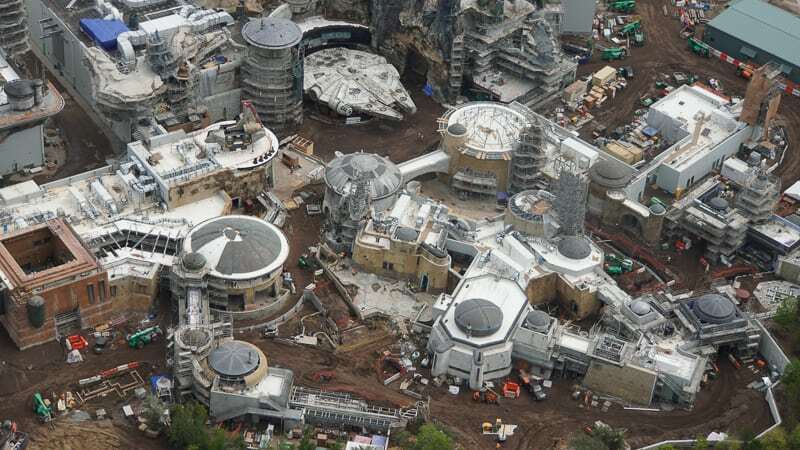 It’s gonna take a while to go between all those buildings and make it look old, but it looks like it will be pretty spectacular when done! 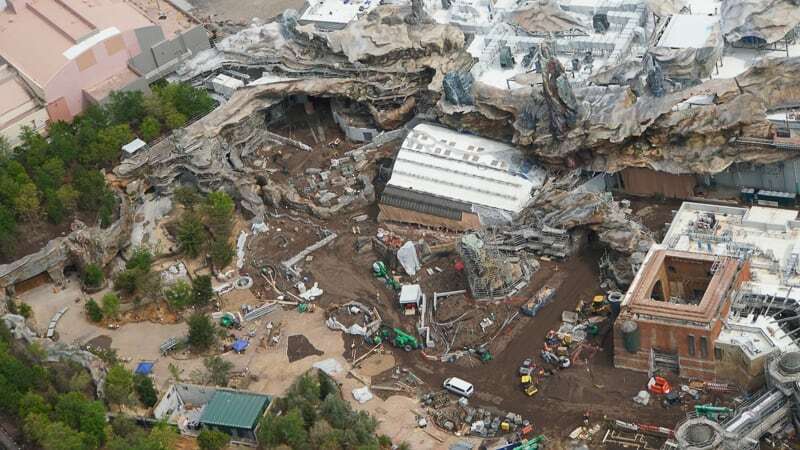 The ship is called the TIE Echelon and will stay here to keep the citizens of Black Spire Outpost under control. 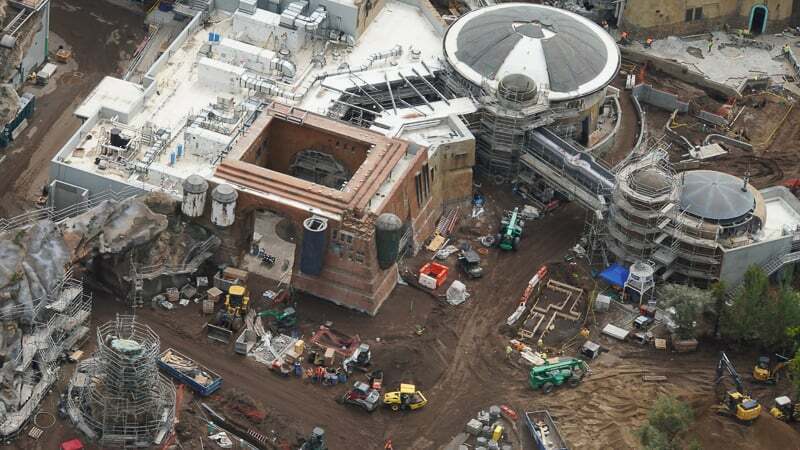 Star Wars Galaxy’s Edge is being built both in Disney’s Hollywood Studios, but it’s opening first in Disneyland. 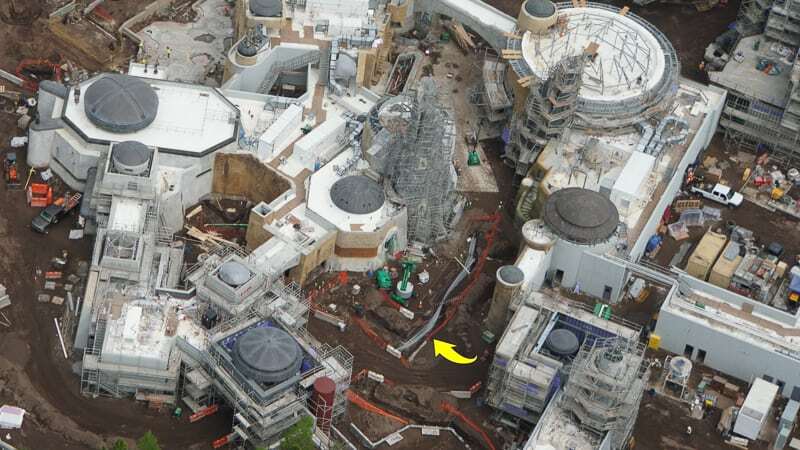 The two lands are pretty close to identical, except that there are only 2 entrances in Hollywood Studios instead of the three you find in Disneyland. 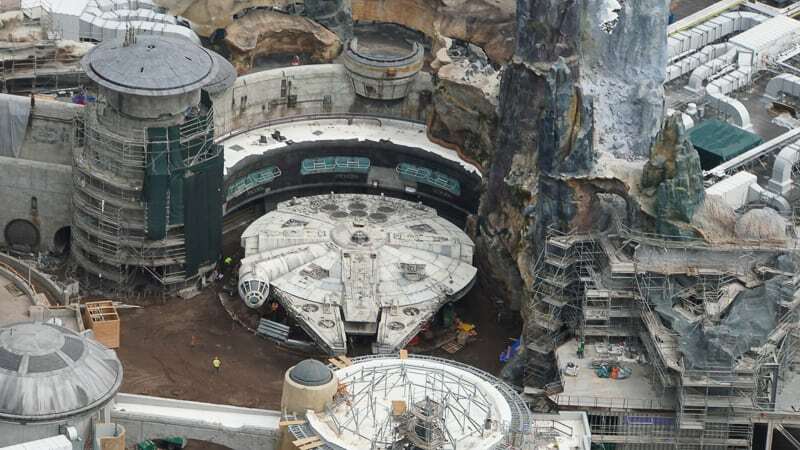 Let’s head over to the Millennium Falcon next! 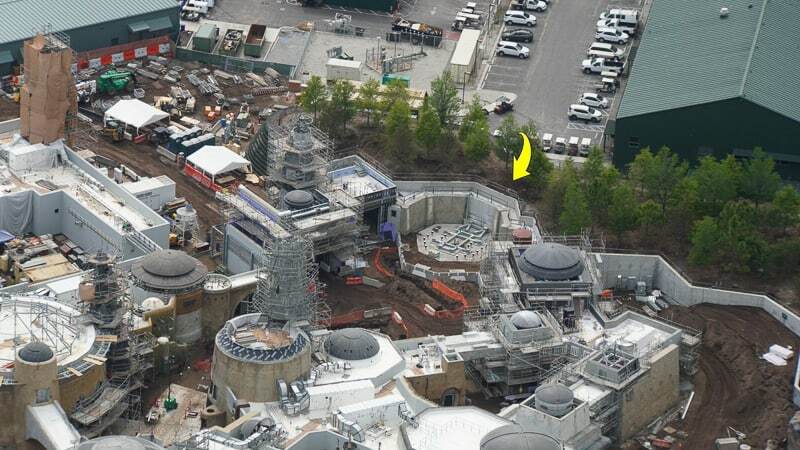 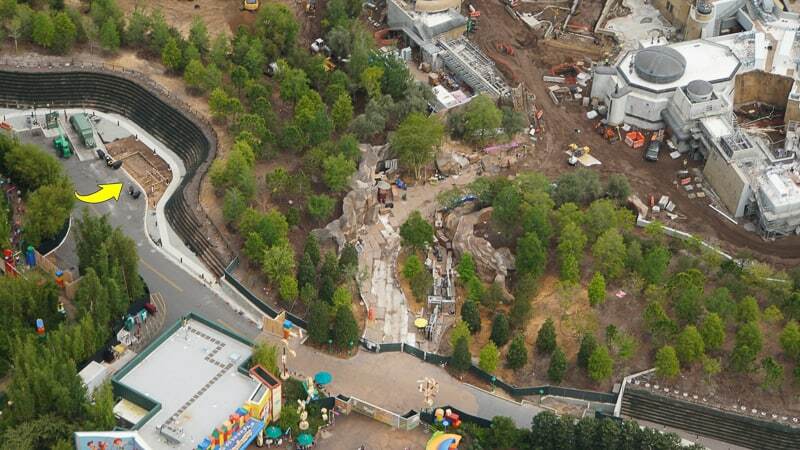 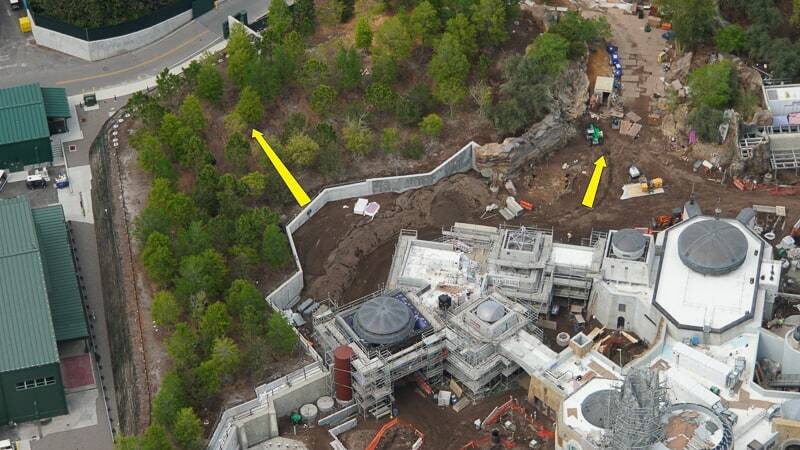 An area is also being prepped here for a Resistance spaceship to come and land! 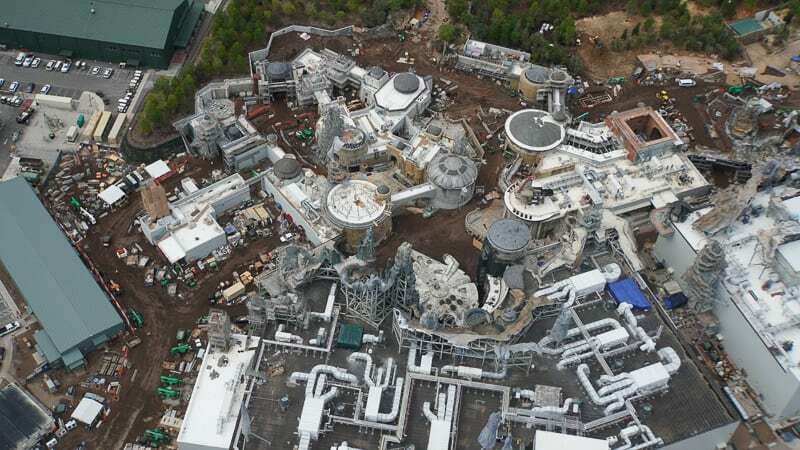 That’s all for now but keep checking back for more updates on Star Wars Galaxy’s Edge as I’m going to continue to update this post with more updates throughout the month! 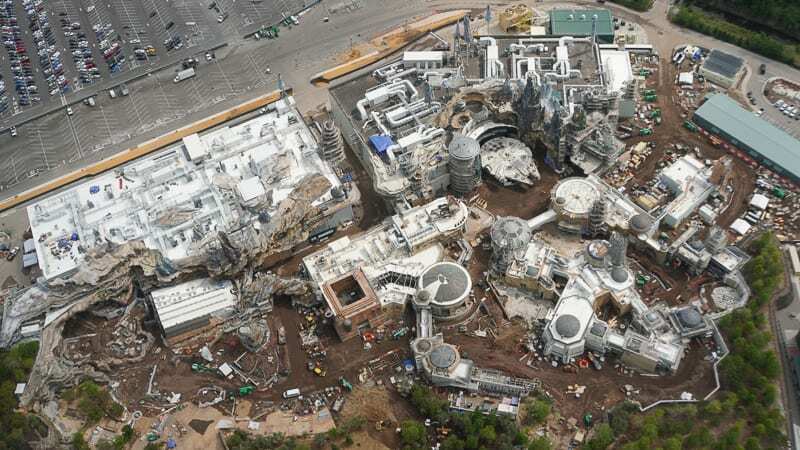 Star Wars: Galaxy’s Edge opens May 31, 2019 in Disneyland and August 29, 2019 in Disney’s Hollywood Studios. 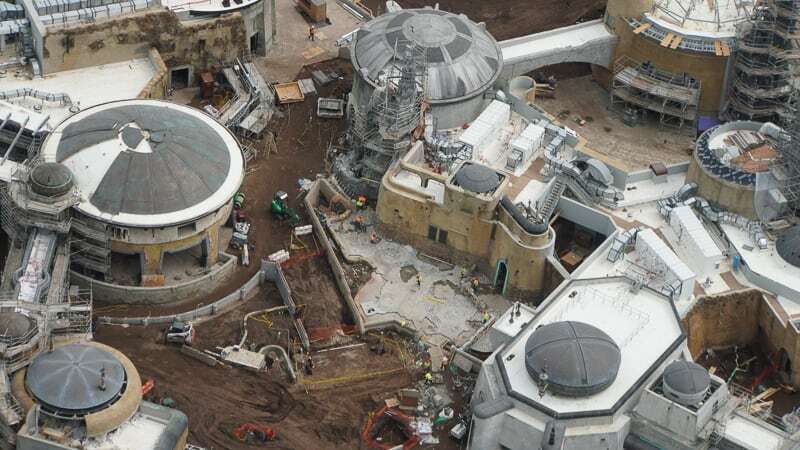 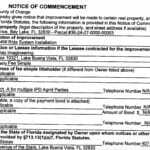 Be sure to read our post explains about all the Disney World Construction projects currently going on around property! 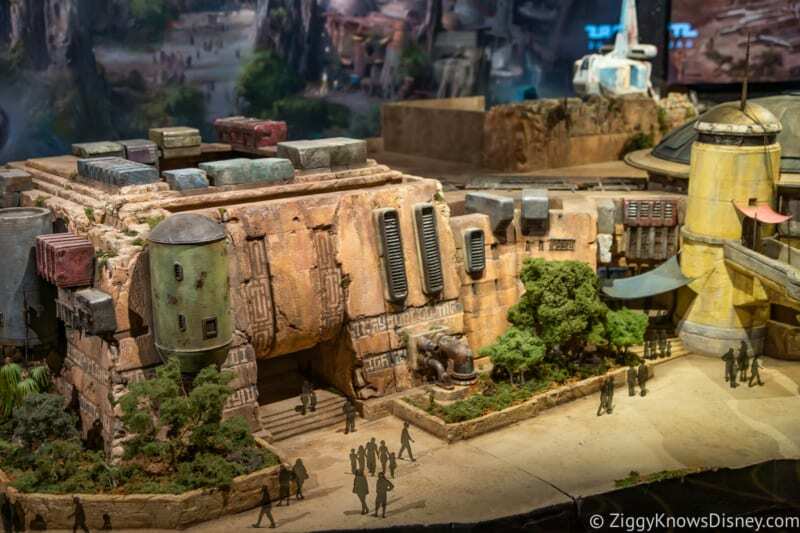 When are you going to Galaxy’s Edge? 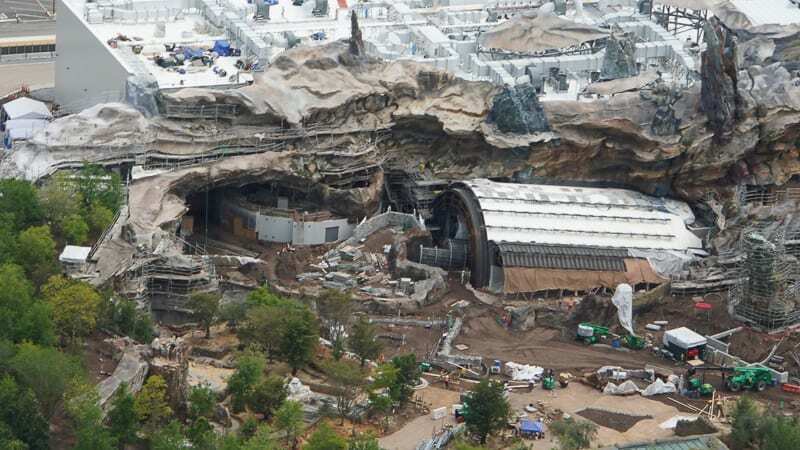 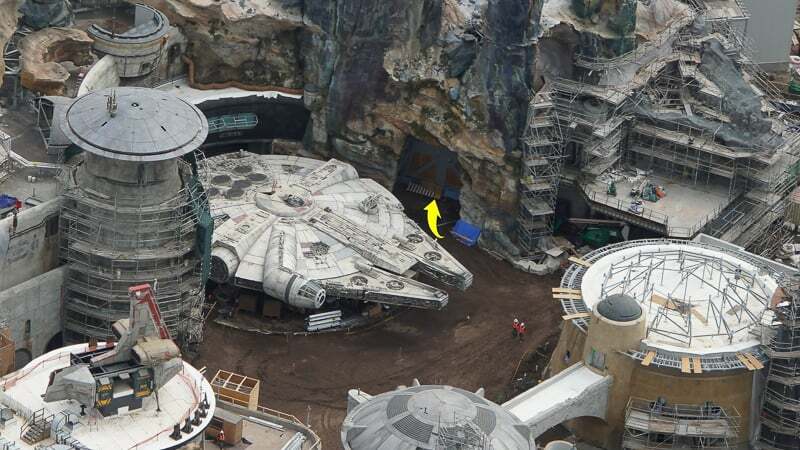 RUMOR: Star Wars Galaxy's Edge Opening Date Revealed? 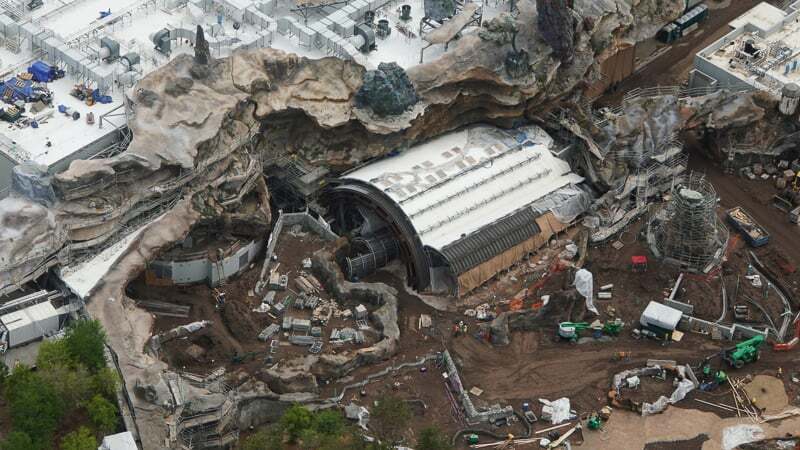 If you build it the dumb dumbs will come.